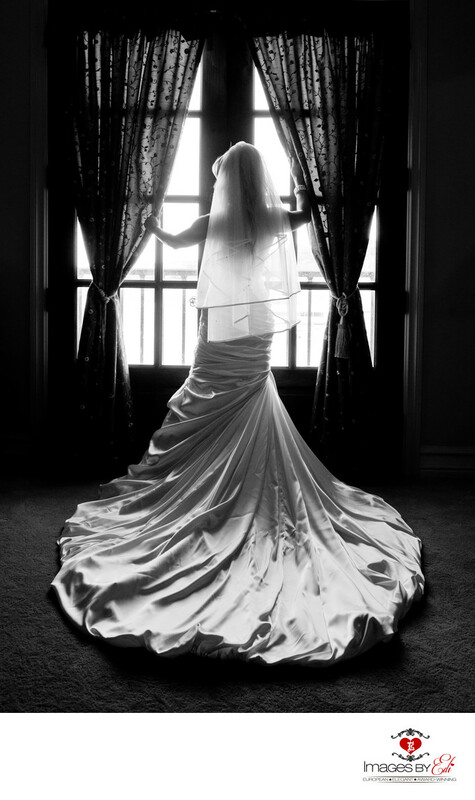 This black and white image is capturing the bride in front of the window looking out to the lake before their Hilton Lake Las Vegas Capella Di Amore Wedding Chapel ceremony. The beautiful, Mediterranean-inspired chapel is located on the Italian inspired Pontevecchio bridge, with spectacular views of Lake Las Vegas and the surrounding Mountains. Keywords: Bride alone (150), Hilton Lake Las Vegas Wedding Photographer (33), Hilton Lake Las Vegas Wedding Photography (33).